The Frog has more Used Walkin coolers & freezers with new refrigeration for sale- lowest prices- sizes 4×6, 6×6, 6×8, 8×8, 8×10, 8×12, 8×14, 8×16, 8×20 and any custom size YOU need. Combination cooler/ freezer units available in all sizes above too. Want a walkin door moved? No problem we do lots of custom work because we are good! Don’t see what you need? 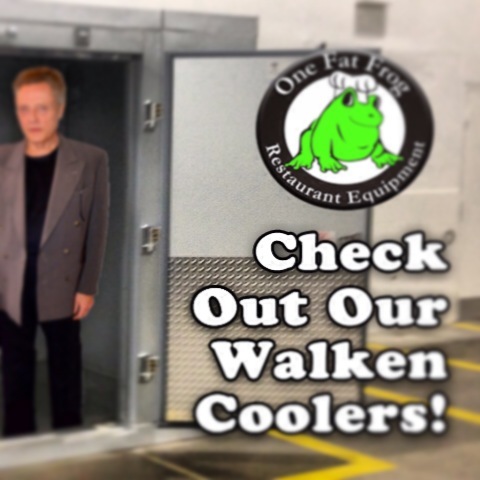 We do more used walkin coolers than anyone out there and a lot of it is custom. Just Stop in our hundred thousand square feet of food and beverage love and let us know what you need. Are you in Naples or Pensacola and want to order over the phone- no problem! Super easy financing to clients in the US – free delivery most of Florida. We can finance florists, hunting camps, churches, schools or bars. We also do a variety of glass door coolers and meat rooms.